In the simplest biz of you terms I can think of accountability is saying what you do and doing what you say. This taking responsibility for your actions in a manner that others can count is the basis of integrity. It is fundamental to managing the business of you as stated in a previous post about supporting accountability. Looking further accountability has many levels. There’s a good wikipedia article about the topic and it covers political, ethical, administrative, individuals within organizations, constituency relations and public/private overlap. For the biz of you, I want to focus on individual accountability. More specifically, the business of you has much to do with holding ourselves accountable. It is answering to ourselves over time. The things we tell ourselves we are going to do in both short and long terms only our future selves can hold us accountable for. To reframe that proposition, we must hold ourselves accountable for the things we told ourselves we were going to do. If we told ourselves we were going to complete high school or college then by all means we should be responsible to ourselves and get that done. We should establish expectations for ourselves so that we may take account for this things in the future. We are liable to ourselves first and foremost. If we say to ourselves we are going to do something then we should apply all available resources to do it. This means using our attention, actions and attitude to our own benefit. When we align our benefit with those around us and the organizations we work for then our accountability not only make us personally successful but influences the success of others and the organizations we work for. It is up to us to lead ourselves in every situation and take account for our actions and whether they meet our expectations. 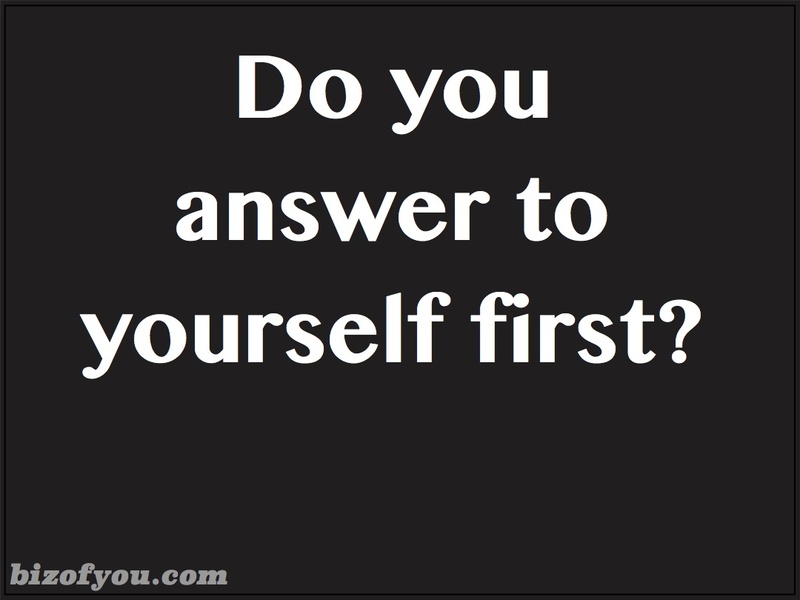 We answer to ourselves first before we answer to others when we manage our business. We are accountable to ourselves first and foremost. ← Profit comes when the job is done right.